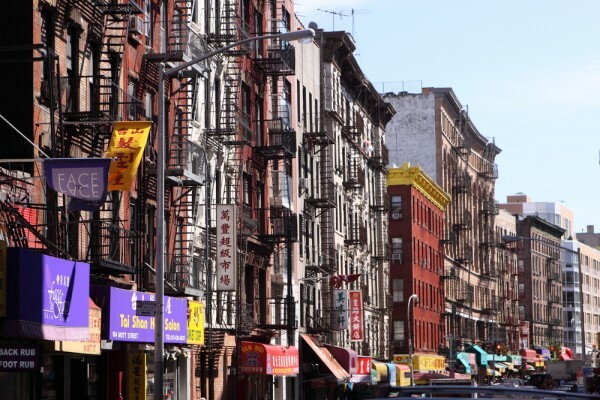 Chinatown, New York is its own destination: Great for bargain shopping, food, history, and the chance to soak in Chinese immigrant culture, it’s a fantastic neighborhood. But it can also be confusing and chaotic to the first-time visitor… which is why we’ve written this handy guide to exploring Chinatown! 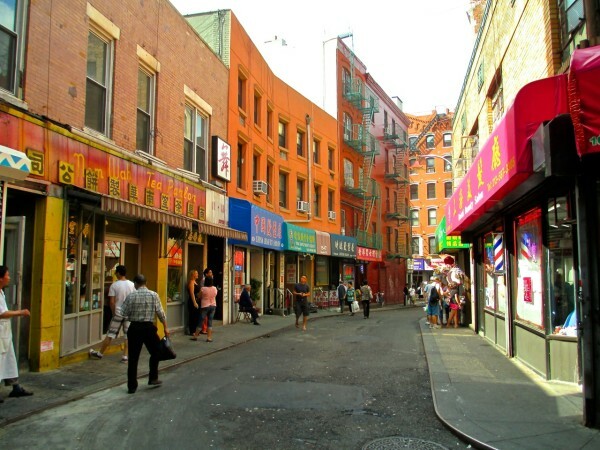 Note that New York City has several Chinatowns, including communities in Flushing, Queens and Sunset Park, Brooklyn. While we’ll explore those communities in later posts, this is a tour of New York’s oldest and best-known Chinatown: that in lower Manhattan. In the 1870s, Chinese immigrants, fleeing persecution while toiling in the American West, began arriving in New York City. 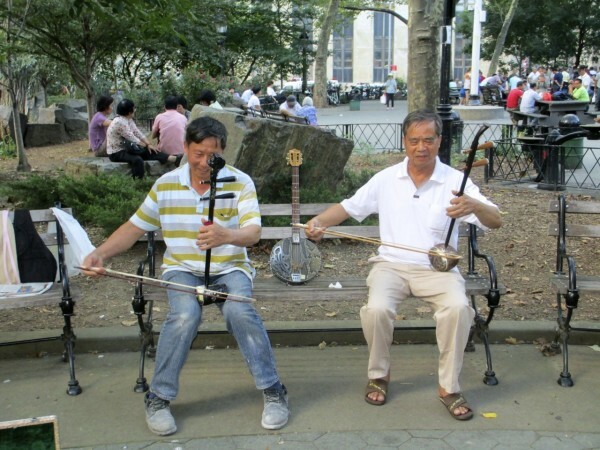 A small Chinese community took root on Mott Street. Thanks to outside bigotry and the cultural divide, the immigrant community was fairly separate from the rest of New York. In the ensuing decades, tales of opium dens, prostitution, and murders between warring Tongs led to the notion of Chinatown being a dangerous, mysterious quarter. In the early 20th century, New Yorkers in search of the “exotic” began to visit the neighborhood (particularly its restaurants). Tourism had arrived in Chinatown. In 1965, discriminatory U.S. immigration policies against Asian countries were amended. Chinese immigrants began flooding into New York City. 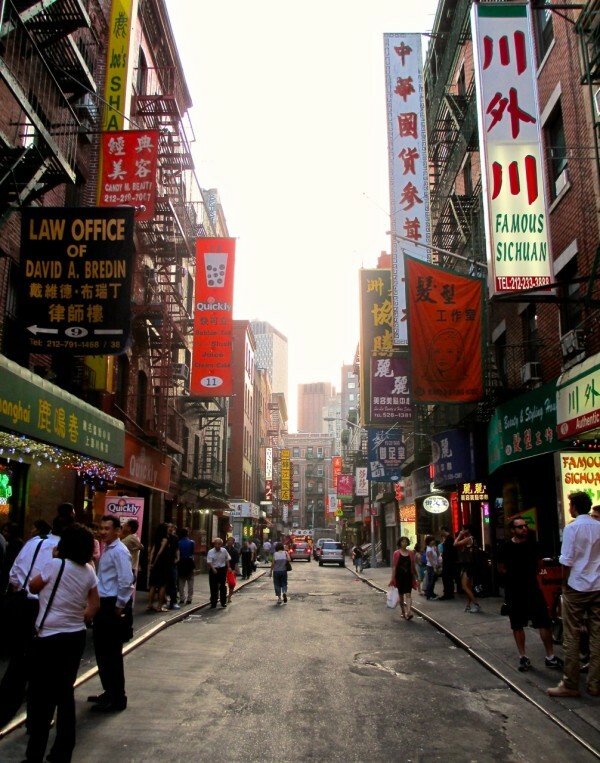 Chinatown expanded into Little Italy and the Lower East Side, becoming home to several Asian cultures, as well as to Puerto Ricans, Dominicans, and hipster New Yorkers. To get to Chinatown, take the N, Q, or R subway to Canal Street (at Broadway) or the 6 to Canal Street (at Lafayette Street). Note: Before exploring Chinatown, you may want to visit MOCA, the Museum of Chinese in America, at 215 Centre Street (located 1.5 blocks north of the subway stop). The wonderful museum features exhibits on the history of Chinese immigration to the U.S., artifacts from old Chinatown, a recreation of an old Chinatown general store, and rotating exhibits on aspects of current Chinese American culture. Once you’ve gotten a sense of Chinatown’s history, it’s time to explore the neighborhood on foot! 1. Begin by heading east on teeming Canal Street, which is lined with narrow shops and stalls selling T-shirts, scarves, jewelry, and “luxury” handbags, perfumes, and watches. 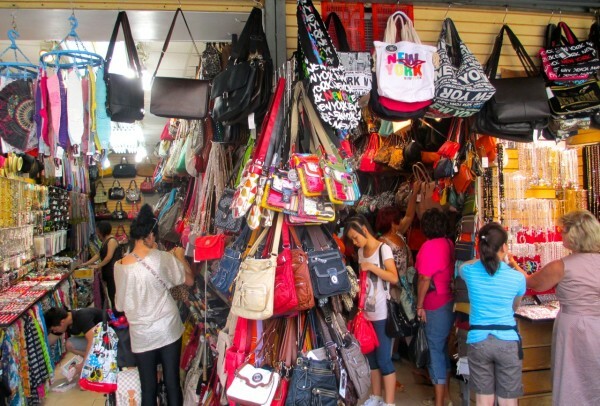 If you’re looking for the high-end “designer” fakes like Coach, Chanel, Louis Vuitton, or Rolex, you may be lured into a tiny back room—like at Phoenix Mall (246-250 Canal St., between Lafayette and Centre Streets), which is a warren of micro shops. 2. Continue east on Canal until it intersects with Baxter and Walker Streets. There you’ll find the bright red Explore Chinatown Information Kiosk, which distributes maps, brochures, information, and has a handy neighborhood map on its sidewall. The block is lined with small restaurants and food shops selling fresh fish and seafood (including live lobsters and crabs!). Along the sidewalks are food carts offering fruits and vegetables, including dragon fruit, lychee, longan, ginger, bok choy, bean sprouts and bamboo shoots. 3. Take a right on Mulberry Street, where you’ll pass several stores selling imported gifts of jade, pottery, tea ware, an array of Buddhas, and miscellaneous tchotchkes. Lung Moon Bakery (83 Mulberry) bakes sweet and savory pastries that are very inexpensive. 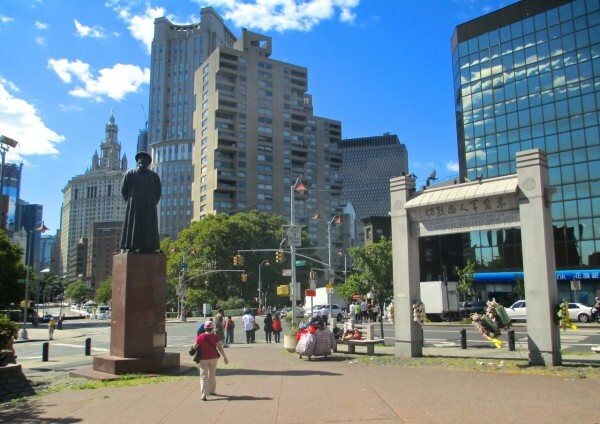 At Bayard Street, you’ll come to Columbus Park, named for the famous explorer—and a sign that, yes, this was once an Italian immigrant community. Columbus Park was created in 1897, when the decrepit tenements of Mulberry Bend (described by Jacob Riis as a “vast human pigsty”) were razed. The park is the town square for the community, and hosts local ensembles performing Chinese opera and traditional music, sports on its southern field, and old-timers gathered for intense games of Chinese Chess and poker. In the pavilion, folks practice Tai Chi and meditate. For a great snack, head to Tasty Dumpling (54 Mulberry) for dumplings or pork buns (5 for $1.25! ), and munch while enjoying the music in the park. A few doors down, look for Fook on Sing (44 Mulberry), part of Chinatown’s Funeral Row. The tiny store sells cardboard designer handbags, sports cars, flat screen TVs, mansions (complete with paper maids and security guards), plastic bottles of Cognac, even stacks of cash. The items, symbolic gifts for the deceased, are burned in traditional Chinese funeral practices. 4. Turn left and ascend tiny Mosco Street (one of lower Manhattan’s few remaining hills) to Mott Street, where Chinatown was founded in the 1870s. This block was the site of the first Chinese general store, restaurant, Chinese-owned building, as well as home of the Chinese Consolidated Benevolent Society. On the corner (to your left) is the Church of the Transfiguration, one of the city’s oldest churches. Since 1801, it has served immigrant communities including the Irish, Italian, and currently the Chinese, with services conducted in English, Cantonese, and Mandarin. Heading south, you’ll pass the new Chinatown Community Center (7-9 Mott St.). This was once the famed Port Arthur Restaurant. Founded in 1897, it was the first spot to draw New Yorkers and tourists with its exotic décor and cuisine (serving “Chinese” delicacies like chop suey, chow mein, and egg foo yung). 5. At the corner, you’ll come to Bowery/Worth Street. The large intersection here is Chatham Square, once a grand marketplace and sordid entertainment center. On the pedestrian island stands the Kim Lau Arch, a memorial to Chinese Americans who fought for the U.S. in WWII. Just behind the island is Dim Sum Go Go, known for excellent, inexpensive dim sum, and the Trans World Buddhist Association, an information center and place of worship. The wide street heading east is East Broadway, the main drag of the newest extension of Chinatown, populated by recent Fujanese immigrants. Wandering East Broadway and the three blocks to its south you’ll encounter a thriving, authentic Chinese immigrant enclave. 6. Back on Bowery, head one block north to Doyers Street, the crooked lane that turns at a 90-degree angle. (Legend has it that Chinese merchants designed its curve to keep straight-flying ghosts from traversing). The green brick building at 5-7 Doyers was the Chinese Theater (1893-1913) where Chinese opera and music were performed, while its upper floors were a flophouse packed with cheap sleeping cubicles. Under this building is a fascinating remnant of old Chinatown: a tunnel leading to the Bowery! Left over from the 18th century Doyers Distillery, which once stood where the (hideous) concrete post office is today, it’s said the Tongs would sometimes use this tunnel to evade the police. In fact, there were so many violent battles and murders here, Doyers was called the “Bloody Angle.” Today, the tunnel is lined with small offices for (ironically) law and enforcement, as well as acupuncture, Chinese medical science, dentistry, a tiny shop for Chinese herbs, and Tin Sun metaphysics, famed masters of Feng Shui. 7. 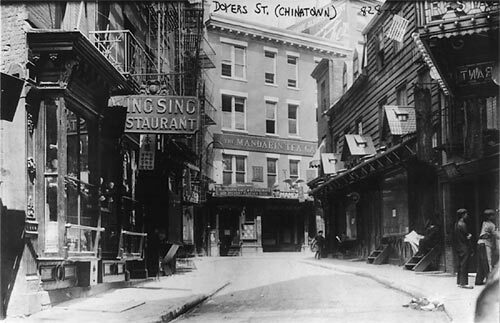 Doyers Street ends at Pell Street, another of the original locales of historic Chinatown. With its profusion of Chinese-character signs, it’s no surprise that postcards of quintessential Chinatown often are taken on Pell. Turning right, you may find a crowd waiting outside Joe’s Shanghai (9 Pell St.), popular for its soup dumplings. The red brick building on the corner of Bowery is the Edward Mooney House, the oldest house in New York. Built in 1785, the building has been a home, tavern, hotel, pool hall, social club, restaurant, and now a local bank. 8. Take a left on the Bowery. At Bayard Street, take a detour to 65 Bayard for the renowned Chinatown Ice Cream Factory, serving homemade ice cream in distinct flavors like green tea, almond cookie, lychee, black sesame, red bean, and taro. When you reach Bowery and Canal, you’ll find a large intersection leading to the monumental entrance of the Manhattan Bridge. 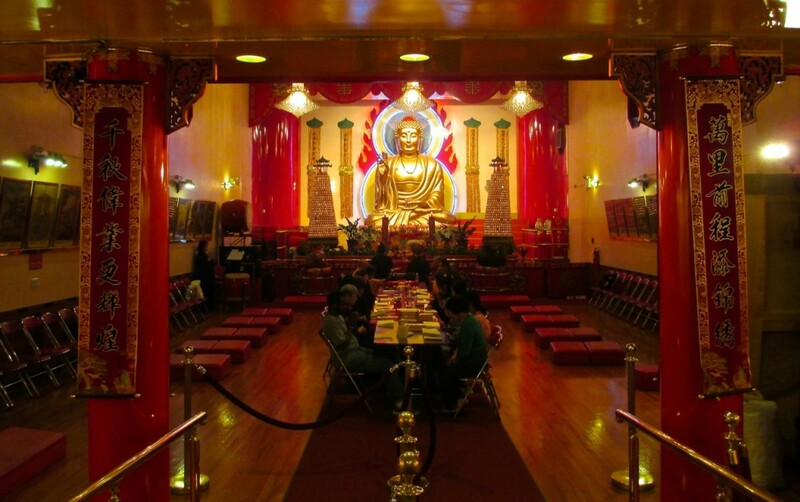 Beside the entrance, to the northeast, sits the Mahayana Buddhist Temple, a peaceful oasis amidst the chaotic streets. Inside, the walls are lined with paper strips bearing prayers and names of the deceased, along with offerings of flowers, fruit, incense and snacks. At the head of the main sanctuary is an enormous golden seated Buddha and, to the right, a huge temple bell. This is an active place of worship, so it’s important to behave with discretion and respect. Be sure to buy a scroll with your fortune for $1, or head upstairs to the gift shop for some excellent bargains. Return to Canal Street and head west for the five blocks back to the subway. Hungry? There are plenty of great restaurants on Elizabeth and Mott Streets, and the Canal Street food carts serve steamed, grilled, and fried Chinese specialties for as little as $1 each. NYC Summer 2013: Fantastic…and Free! I love chinatown! It was the first place I ever tried Dim Sum. So good! 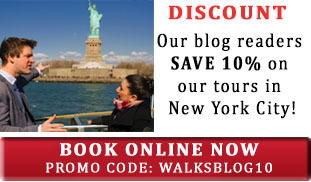 This is a great resource for those planning to visit. Thanks, Leslie. I love Chinatown as well and had so much fun exploring the neighborhood for this piece.